At home and on the go. The slim and light design of the ARCHOS 70 internet tablet makes it both portable and generous for sharing your best moments with your family and friends. All the functions of a computer: your apps, the Internet, your photos, music and videos, eBooks and 3D games. How can this high resolution 7” multi touch screen fit into such a slim and light tablet? Have video chats, film important moments of your life and share them on the Internet or display them on TV with the built-in HDMI connection. The Web browsing experience with the Android™ browser is intuitive and complete thanks to Flash 10™*** compatibility. Get the latest news, send both personal and professional emails and chat with your friends. Play the latest 3D games with the OpenGL 3D graphic acceleration, check news and social networks plus add hundreds more applications via the AppsLib store. 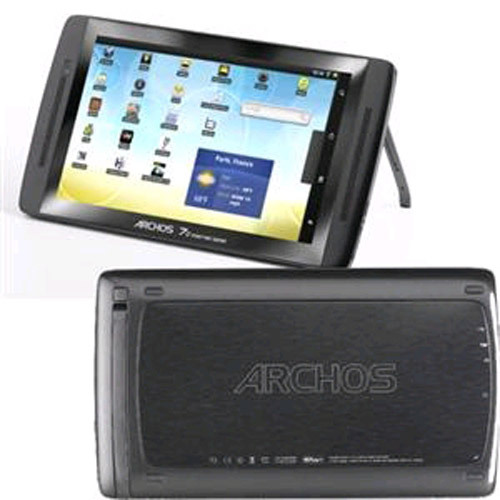 ARCHOS 70 internet tablet, earphones, Standard USB cable, Quick Start Guide (QSG), legal and safety notice, power charger.